Witte Trappist Mandarina Bavaria Is Exclusive Beer Honoring 50th Anniversary of King Willem-Alexander of The Netherlands. 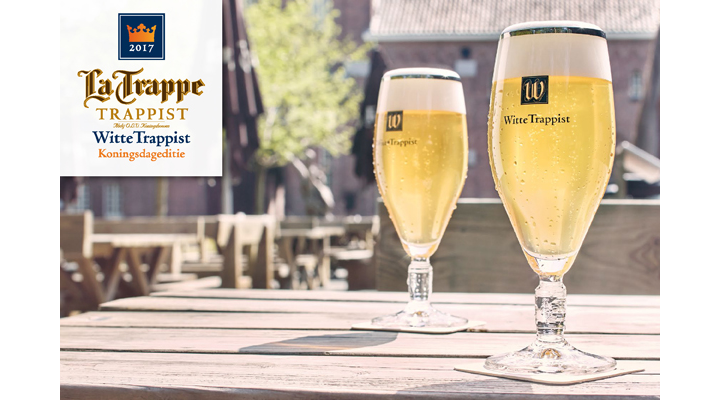 Berkel-Enschot, Netherlands (April 3, 2017) – The Witte Trappist Mandarina Bavaria is an exclusive edition of La Trappe Witte brewed in honor of the 50th birthday of King Willem-Alexander from The Netherlands, also known as “King’s Day.” Due in time for the April 27th holiday, this tropical take on the world’s first Trappist wheat beer will be available on draft across the U.S. for a limited-time only. As the name implies, this single-release brew uses Mandarina Bavaria hops for pleasant aromas of tangerine, orange, lemon and lime. La Trappe Witte’s clean, un-spiced profile showcases these flavors beautifully, with its smooth, slightly tart finish perfectly complementing the fruitiness of the hops. Bred at the Hop Research Institute in Hüll, the Mandarina Bavaria hop varietal displays fruitiness in finished beers, with distinctly pleasant stonefruit and citrus aromas. Since 1890, The Netherlands has celebrated the national holiday of “Queen’s Day” to mark the birthday of the current Dutch monarch. In 2013, Queen Beatrix abdicated her throne and was succeeded by her son Willem-Alexander. Due to this change in regal lineage, “Queen’s Day” is now celebrated as “King’s Day.” Referred to as Koningsdag in The Netherlands, it’s a day of rejoicing and revelry. Streets, houses and businesses are festooned with the trademark orange color of Holland, and stellar local beers flow freely. With Witte Trappist Mandarina Bavaria comes an invitation for people across the world to celebrate this favorite holiday. Witte Trappist Mandarina Bavaria will be available throughout the U.S. in Microstar 1/6bbl ONLY. Tasting Notes: Smooth, slightly tart finish. Aromas of tangerine, orange, lemon and lime. Do you own or manage a bar, restaurant or retail establishment and want to offer La Trappe Witte Trappist Mandarina Bavaria for your patrons? Are you a distributor and wish to carry the La Trappe line of beer? Please contact Lanny Hoff at +1 (612) 245-5433 or by email at lanny.hoff@artisanalimports.com. About Trappist Brewery Koningshoeven: Founded by Trappist monks in 1884, the Dutch Trappist Brewery Koningshoeven has been crafting the finest Trappist ales for over two centuries. Its many world-class style beers and rare limited releases are bottle-conditioned and brewed with water from within the Abbey’s walls, while spent grain from the wort is used to feed the Abbey’s herd of cows. Learn more about the brewery at www.latrappetrappist.com/en/.